We must ensure that animals like this goat have the best possible care after they have been saved from death. With generous donations and help from many people, plans are progressing for a new sanctuary for rescued animals in Kathmandu, Nepal. A blessing for the animals who will have the good fortune to live there, the Animal Liberation Sanctuary consists of thirteen acres of land located in the hills of the Kathmandu Valley, adjacent to Kopan Monastery. 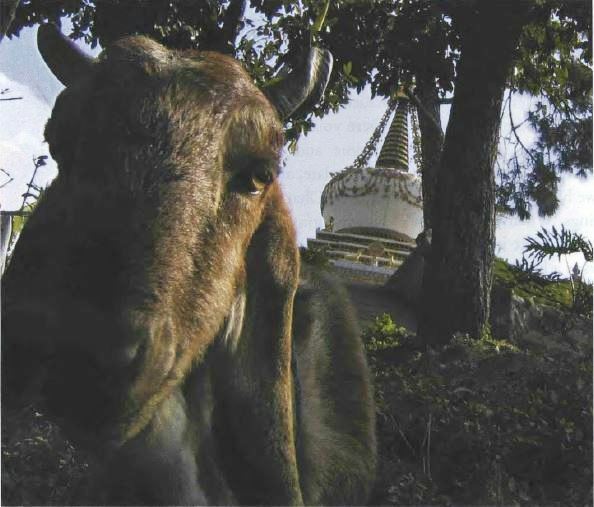 A project of Lama Zopa Rinpoche, its aim is to provide a safe environment for animals that were to have been killed for human consumption or sacrifice (still a popular activity in Nepal), and also to give them the opportunity to accumulate merit and the causes for higher rebirth and enlightenment. When Rinpoche asked in 2003 that land be bought for the animals already housed on the monastery grounds, Kopan Monastery started negotiations to purchase land nearby. Generous supporters donated and raised the required funds – approximately US$70,000 – and the land purchase was finally completed in 2006. Before the animals can be moved onto the land, much work is required to build infrastructure and facilities. Through the continued support of kind sponsors and fundraisers, over US$100,000 has been gathered for building and development. Considerable preliminary assessment work over the last year will ensure that the land will be used most effectively. A number of challenges need to be overcome before animals will be able to live there. The land is terraced, it is steep, and there is currently no vehicle access. Tibetan Buddhism teaches you to overcome your dissatisfied mind, but to do that you have to make an effort. To put our techniques into your own experience, you have to go slowly, gradually. You can’t just jump right in the deep end. It takes time and we expect you to have trouble at first. But if you take it easy it gets less and less difficult as time goes by.